1. How do I apply for jobs? You can start by creating an account at https://www.wobbjobs.com/ and upload your latest CV. 2. What sort of jobs does WOBB provide? We have all sorts of jobs listed on our website including creative, sales and marketing, accounting and finance, technology, consulting, management trainee positions and more. Our focus is on professional office jobs, and we are always working hard to increase the number and quality of jobs on our platform. 3. What is the status of my job application? The status of your application will be changed to "viewed" once the employer has viewed your CV. If an employer marks your application as shortlisted, KIV, or rejected, you will also be able to see this from your job application status. You do not need to do anything at this point except to be aware of phone calls and emails from potential employers who would like to invite you for interviews. 4. How long does it take for the employer to get back to me if I’m shortlisted? This process varies from company to company. Please see the previous question to understand how WOBB assists in tracking your application status. 5. Can I cancel the job application that I’ve sent out? There is a 30-minute cancellation window once you apply for jobs via WOBB. On our mobile app, click on the Profile section from the menu > click on the burger button (=) > click on Job Application History > click on Cancel Application to cancel unwanted/accidental job applications. If the job shows “Application Sent”, it is too late to withdraw the application. On our website, simply click on your profile icon on the top right hand corner, click on Job Application History, then click on Pending and cancel any unwanted/accidental job applications. 6. Why is the status of my job application “pending”? The 30-minute cancellation window is to allow you to withdraw any unwanted/accidental job applications in the Pending list. However, after 30 minutes, your application will be sent out to the employer, and will be removed from the Pending List. This cannot be withdrawn. 1. Why does WOBB screen CVs? WOBB promises quality CVs to employers that post jobs with us, that is why we screen every single CV that is uploaded to our platform. 2. Why is my CV rejected? Malaysians or non-Malaysians with visas / permits to work in Malaysia or with work experience in Malaysia. Complete CVs that contain your contact details e.g. email, mobile phone number etc. Not to worry, if you have you've forgotten to add any of the needed information mentioned above, you can simply update and re-upload your CV on WOBB through your jobseeker dashboard. 3. Do I need a cover letter to apply for jobs on WOBB? It is not necessary to upload a cover letter to apply for jobs on WOBB. 4. What happens to the job applications that I sent out before my CV is approved? Your job applications made before your CV is approved will be automatically sent out to the employer after it is approved. Kindly click on the “Forgot your password?” link on the login page. The password reset link will be sent to your email address. Make sure you reset your password within 24 hours upon receiving the email, otherwise you will need to re-request for a new reset password link via the login page once again. 2. How can I delete my account? To delete your account, kindly drop us an email at [email protected] and we will help you out. We would be sad to see you go, though. Feel free to drop us an email at [email protected] to get in touch with us directly. 1. Is it free to register as an employer on WOBB? Registration is absolutely free! If you haven’t already, create an account here. 2. This is my first time signing up but the system keeps saying that my company is registered. Someone in your company (or an ex-colleague) could have registered on WOBB on your company’s behalf. Please write in to [email protected] and one of our consultants will help you solve this issue. 3. How do I change my company account details? From your employer dashboard, click on the green “Update Company Details” button, which is at the top of the column on the left side of your screen. 1. How do I post/advertise a job on WOBB? You need to purchase job tokens in order to post job advertisements. Job tokens can be purchased via our online shopping cart. For our high-value bundles, please write in to [email protected] and one of our consultants will be in touch with you to customise a package suited to your hiring needs. 2. How do the job tokens work? Job tokens are credits you use to post job advertisements on WOBB. 1 job token = 1 job advertisement. 3. When do the job tokens expire? Unused tokens have NO expiry date. Once a job token is used to activate a job advertisement, the job advertisement will be active on WOBB for 2 months, unless you manually deactivate it. 4. How much are WOBB’s job tokens? Our job tokens generally range from RM250 to RM450 depending on the quantity purchased. For unlimited job advertisements, please contact us for a quote. 5. How do I make payment to WOBB? We accept credit cards, bank transfers and cheque payments. Payment details will be sent to your email after you place an order via our online shopping cart. For cheque deposits, you need to email your proof of payment to [email protected] for verification. Your tokens will be issued once we receive your payment slip, and you’ll be able to start posting job advertisements immediately. 1. How do I post a job advertisement? Login to your employer dashboard. Click on “Post A New Job”. 2. Can I still edit my job after it has been posted? Job descriptions can be edited anytime after posting. However, job titles, job track (e.g. sales and marketing / finance and accounting / etc.) and job type (e.g full time / part time / etc.) can only be edited within the first 14 days after activating a job advertisement. Click on the ‘Edit’ button attached to the job you want to edit. Make necessary changes and click ‘Update Job’ to save and publish. 3. Can I preview the job before publishing it live? Yes, you can. On the Post A Job page, you can click Save Draft and Preview Job to see what your job will look like once it’s published. 4. I have found a suitable candidate. How can I deactivate the job? Scroll down to the bottom and select a reason for job deactivation. 1. How do I create a Company Profile? You can upload your own pictures from your employer dashboard by clicking ‘Create Company Profile’. You can find this button at the bottom of the web page. Alternatively, we have a highly skilled in-house creative team that specializes in producing professional pictures and video content for employer branding purposes. Please reach out to [email protected] to learn more about this option. View our Company Page to get an idea of what your professionally produced Company Profile will look like. Scroll down to the bottom of the page and click ‘Edit Company Profile’. 1. How do I view the number of applicants to a job advertisement? From the your employer dashboard, click “Manage Jobs” and the total applicants can be seen on the green button. Click on the button to view the job applications. 2. How do I check my applicants? The CVs will be sent to the “email to receive applications”. This can be set when filling up details for a job advertisement. Login to your employer dashboard to view the CVs. 3. Why am I not receiving CVs in my email? Make sure that you fill up the “email to receive applications” section to allow CVs to be sent to your email. This is done together when you set up a job advertisement for posting. In some cases, the emails may end up in your junk mail due to your email settings. 4. Can I mass download the CVs? You cannot mass download the CVs from your employer dashboard. Please write in to [email protected] for this request. 5. I only want certain gender or race to apply for my job advertisement. Is there an option to choose the gender/race? No, jobs posted on WOBB have to be compliant with the Non-Discriminatory policy. 6. How do I purchase CV Search Access? Click on “Top Up Tokens”. 1. I am not getting enough applications. What do I do? If you do not have a company profile yet, we strongly suggest that you create one (see here). Company Profiles help you attract 3.5x more applications! Alternatively, you can attract more eyeballs by boosting your job with our Booster Tokens. 2. 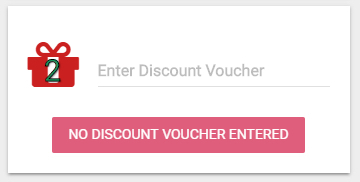 How do I apply discounts? Discounts can be applied by clicking on the red gift box on Step 2 of the online shopping cart. 3. How do I upload a video? Videos need to be sent to us for uploading. You may email links/files to your respective sales consultant or to [email protected] and we’ll help you out. 4. 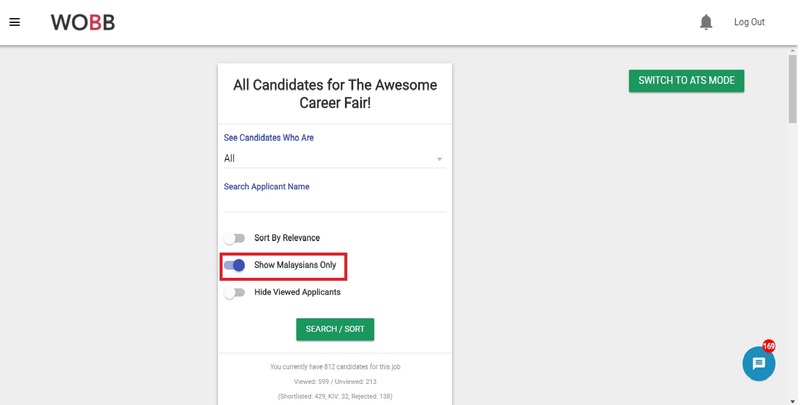 I don’t want to receive Non-Malaysian CVs. What should I do? Click on “Show Applicants” for the particular job. Switch to List Mode (yellow button on the top right). Switch toggle for “Show Malaysians Only” on. 5. How does the LinkedIn Auto-share feature work? LinkedIn Auto-share syncs your WOBB account and your LinkedIn account. Jobs listed on WOBB will automatically be shared on your LinkedIn feed on a weekly basis. If you have a Company Profile on WOBB, this will also be featured on your LinkedIn feed on a weekly basis. It is recommended to sync your company's LinkedIn Page, however, if you currently do not have a company account on LinkedIn, you can sync your personal account first and change it anytime. To sync your company’s LinkedIn Page, simply enter the email address attached to the LinkedIn page, and our Auto-share will automatically connect the posts to the connected LinkedIn Page. 6. What other services does WOBB have? Check out our Product Packet to see all of our products and services.